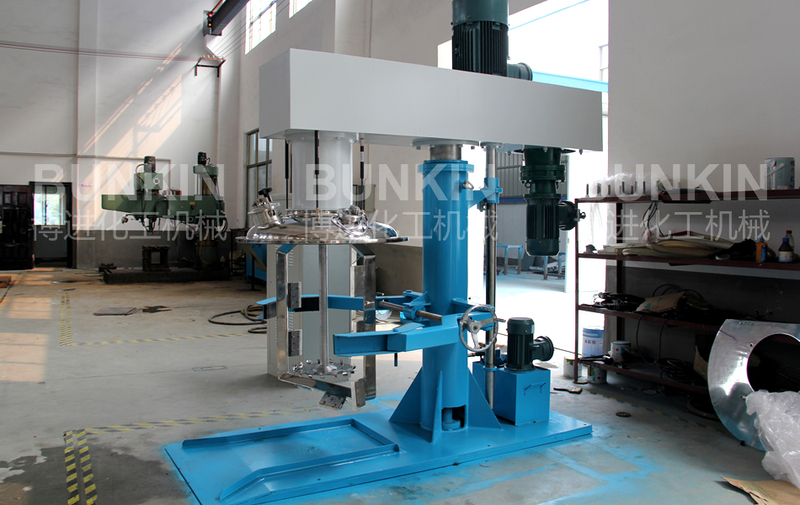 Disperser with Scraper_Anhui Bunkin Chemical Machinery Co.,LTD. Applied materials: Suitable for many kind of liquid chemicals emulsion paint, industrial paint, ink and colorants, electrics battery pastes etc. 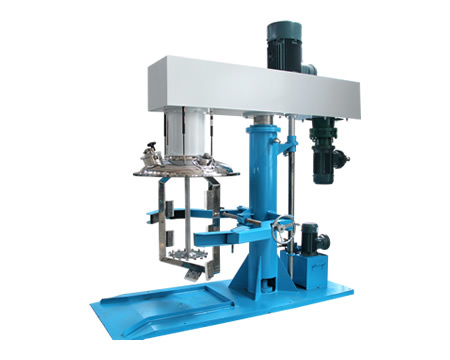 The disperser with the dispersing and scraping function developed based on the standard high speed Disperser. During dispersing process, scraper can rotate along the tank will and generates a radial mixing flow. In addition, the PTFE scraper can scrape the materials on the tank off efficiently. It is an ideal equipment to stir high viscosity and sticky mixture. Application Fields: Suitable for dispersing, mixing materials in industries such as biology, pharmacy, food, paint, ink, adhesives, pigment, fertilizer etc. Through the high speed rotation dispersing disc, the materials flow in annular form flow, resulting in strong vortex flow, which descend down to the bottom of the vortex in spiral state. During the process, materials are dispersed, dissolved, mixed and emulsified efficiently due to the strong shearing crash and friction among the particles. PTFE scraper rotates clinging to the tank wall to scrape the materials staying on the tank wall off and also enhances the material circulation. The hydraulic pump drives the hydraulic cylinder ascend and descend, which drives the whole transmission and working set up and down. A steel fabricated enclosure inside which is installed the drive assembly consisting of a set of balanced pulleys, V belts, electric motor and motor tensioning device. The drive head is of hinged type construction which can be opened for maintenance. A SS 304 shaft duly machined and balanced is provided with a cowless disperser blade of special design for quick and efficient dispersion. The disperser��s blade is made from special steel to withstand high wear and tear. The shaft is installed in a bearing housing provided with taper roller bearings. Lubrication points are provided on the housing. The entire drive head and shaft is mounted on a hydraulic column which can be lifted and lowered to clear the height of the vessel. The Hydraulic column comes complete with hydraulic cylinder, piston rod, power pack unit, valves electric motor and all interconnecting pipelines and hoses. A speed reducer is amounted on the machine to control and slow down the speed and let the wall scraper mixing the mixtures based on different application. An AC Frequency inverter installed in a panel controls the RPM of the Disperser shaft from 0-1500. The inverter is provided with settings for monitoring torque, amperage, voltage, power factor etc and is PC compatible. A control panel is provided with the following functions. Main motors on off, ammeters, voltmeter, emergency stop, inverter trip, indicating lamps, speed control switch, RPM indicator. All internal wiring is per international codes of practice. A remote control panel is provided with the following ex proof controls. Main motors on off, ammeters, voltmeter, emergency stop, inverter trip, indicating lamps, speed control switch, RPM indicator. All internal wiring is per international codes of practice. The inverter is installed in a separate panel and is to be installed in a safe Non-Ex proof zone. A vessel locking device consisting of locking arms, cantering device, and manually operated locking screw is provided. The vessel is fabricated from SS plates and is provided with 3 nos castor wheels, SS bottom discharge ball valve and towing handles. All SS parts are duly polished inside and outside.